Medium Nappyneedz front snap pocket nappy. Our Witch pocket nappy is perfect for Halloween, or just because you like something a little spooky! Hand guided witch and moon appliqué to back and hand guided bats on front of nappy. On rare Moonberry minky fabric. 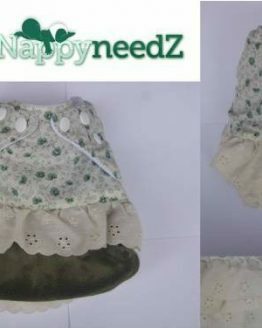 Our witch pocket nappy is a one of a kind nappy, and due to the fact that it is decorated with hand guided appliqué it cannot be recreated exactly the same again. 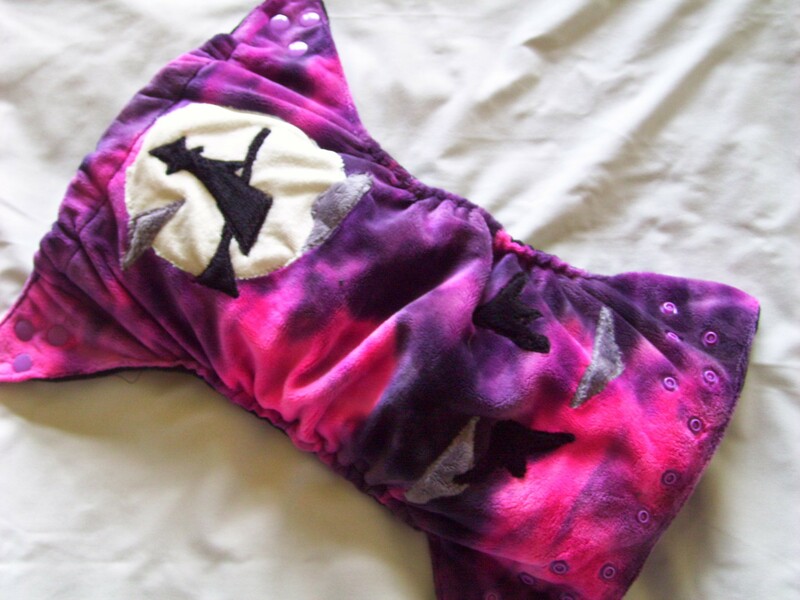 The witch silhouette is made from black minky and is on a cream bamboo velour moon. This witch pocket nappy is a medium nappy is to fit approximately 6-12 kg in weight. The nappy fastens with snaps to the front, and has a double layer of elastic to te back and firm leg elastics, to help prevent leaks. The nappy is a pocket nappy with a hidden PUL layer, so that it does not require a separate cover. With a deep and generous pocket for easy stuffing, the nappy is lined with black microfleece. This microfleece lining acts as a stay dry layer, which means that liquid passes through the nappy easily but it does not feel wet against the skin. The nappy comes with a bamboo and microfibre tri-fold insert. Like all of our one of a kind pocket nappies, this witch pocket nappy is hand made in New Zealand.